A BISHOP yesterday described an art exhibition as "offensive and unacceptable" over its depiction of the Virgin Mary. The UCC exhibit entitled 'Our Lady and Other Queer Santas' has sparked outrage with some Catholic groups. The Bishop of Cork and Ross John Buckley yesterday said the exhibit goes beyond the bounds of pluralism and respect. 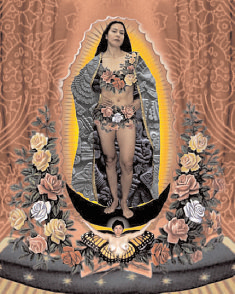 One of the most controversial aspects of the exhibition is a collage of digital photos, one of which shows Our Lady of Guadalupe in a floral bikini being held up by a bare-breasted angel. "Many people were offended by the proposed exhibition and the portrayal of the mother of God in such a fashion," Dr Buckley said in a statement. "True pluralism respects the beliefs of all faiths and does not seek to ridicule the faith and convictions of any believer. "We have seen the negative consequences that result from a lack of respect for religious beliefs in many cultures. An inclusive and open society must show respect for the religious beliefs and iconography of its citizens. "Irish poets and culture held Mary in the highest esteem. It is regrettable and unacceptable that this exhibition seeks to portray the mother of God in such an offensive way," Dr Buckley said. Fine Gael TD Jerry Buttimer claimed that many regard aspects of the exhibit as "blasphemous". UCC did not respond to questions from the Irish Independent on the matter last night.